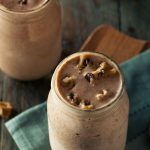 This Homemade Cookie Dough Smoothie can also be easily turned into a protein shake by including the optional natural plant based protein such as nuts or seeds. As well as this lovely moreish Homemade Cookie Dough Green Smoothie recipe, I have been very inspired lately on lots of different levels and couldn’t wait to share it with you. Although I’ve been posting regularly, I wrote a few posts before going on holiday so I’ve actually had a break from blogging. We went to visit family and friends for 9 days across Scotland and England and we came back feeling so refreshed and raring to go. We thought it would be a lot of hard work as we’d found travelling with our baby hard work before, but it actually felt like a proper holiday this time. I think the glorious weather had something to do with it though. We live in north of Scotland, Inverness where we hardly get any hours of daylight in the winter and far too many in the summer, but daylight and sunshine are two totally different things. And apart from 3 days this year it has literally been grey, cold, miserable and raining practically every day. I’m a real outdoorsy person so I never really feel myself when I don’t get fresh air. I didn’t realise how much we all actually need sunshine for health until this holiday. Before I adopted a more healthy diet, me and the sun didn’t get on at all. After 5 minutes in the sun I would be dizzy, weak with a headache and have such bad sunstroke I had to come inside and sleep it off. Needless to say holidays abroad have been a bit difficult or non existent. Anyway, as soon as I started a raw food diet I could immediately sit out in the hot sun, and after a few months I could run in the hot sun too. When I went back to cooked vegan food I thought I may go back to sun intolerance, and I’ve had so little sunshine I’ve not been able to test my theory, until now. We sat out in families back gardens eating dinner, had picnics and did some short walks and I felt absolutely fine. In fact I felt better than fine, I felt totally alive. I think this is one of the major areas of health that was severely lacking so it’s great to finally have the opportunity to be healthy in this area. In the past, I’ve treated holidays as an excuse to binge on chocolate and junk food, even vegan junk food once I became a vegan. I dropped all my healthy eating and generally felt ill and tired throughout every holiday. 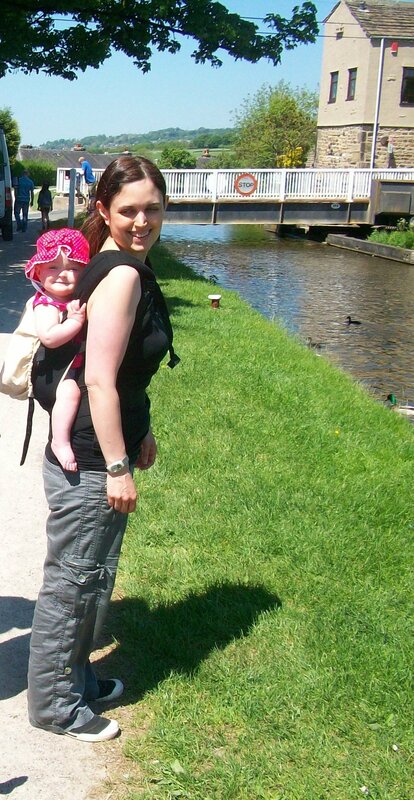 This holiday I was determined it was going to be different especially as I have a baby to look after. She’s now on solids so it’s important for me to keep her food healthy and consistent. So I packed up my cheap blender and made us both green thickies every morning. I made such a big batch of green thickies that I ended up drinking them for lunch too which was really flexible to carry them around in my big travel mugs, and if we went for a meal anywhere I just got a salad as I wasn’t hungry. I think it made the world of difference to how I felt and even though we weren’t getting much sleep as our baby was waking up earlier and earlier with the light, I didn’t feel bad for it at all. Amazingly I also didn’t put on any weight at all which is also a first for me. Usually I put on at least 6lbs when I go on holiday. It was also a good excuse to try out my less powerful blender so I can give better advice to those who haven’t invested in such a good blender. I’ll be giving you some hints and tips to make your green thickies really smooth in any blender in future posts. If you haven’t read my latest post about how to dramatically improve your health in 20 minutes – I talk a lot about balancing your health. I actually wrote the bulk of this post before I left for my holiday but it was funny, a lot of the reading I did echoed what I said in the post so I think it’s definitely time for me at least to take my health to the next level. I realised there were certain areas that were lacking. 1) Drink more water rather than herbal tea. I have now been drinking 2 litres of plain water a day. I drink a pint of water 30 minutes before every meal. I already feel loads better from doing this and my skin is looking much more hydrated. 2) Get to bed by 10pm. I have to say, I find this most difficult. With a baby the day goes so fast, there is always so many chores to do in the evening and I also like to work on my blog plus squeeze in a little bit of time to relax. It doesn’t exactly lend itself to getting to bed earlier but I’m going to keep working on it as I know when I have a decent 8 hours sleep I feel so good the next day. 3) Have one rest day per week. This is biblical and before baby and blogging days I didn’t have to force myself to have rest day per week but now it feels like non stop and when I’m not preparing something in the kitchen or doing baby things I’m on my computer. So this will probably make the world of difference. 4) Have regular fasts. This is also biblical and something I’ve never done before unless forced into a fast through illness. I think I’ve tried a couple of times but always felt so ill I couldn’t even go without one meal. Now that my diet is a lot healthier I am wondering if I can tolerate a fast more easily. I think it will be good for me spiritually, a good discipline, and great for my health. Although I’m feeling healthier than ever I still have some lingering small health problems that I’d love to clear up and I’m not sure just changing my diet is enough. I think I eat so frequently that my body never has a chance to work on old health problems. 5) Give the day over to God. I must admit, since I had a baby I’ve barely had time for God and my faith has been totally squeezed out. This needs to change and the only one who can change this is me. I think I’m ready for this now. 6) Make a fresh evening meal every day. Big batches of freezer meals have been a life saver since my baby has been born and I’ve only had to cook once a week. However I’ve just been given a slow cooker which seems the perfect invention for Mums with young children. I can’t always be available to cook an hour before dinner needs to be on the table as my baby might be needing a feed. So if I start the slow cooker first thing in the morning, there will be a lovely fresh meal ready for when my husband gets home from work. Perfect! I don’t know about you, but a bit of sunshine always makes me feel more positive about things and gets me more motivation to improve my life and my health. So summer is the best time of year for me to start some resolutions. Is there anything you’ve improved about your life recently or anything about your health you need to work on? This homemade cookie dough green smoothie recipe was inspired by a recipe on The Veggie Nook blog that I’ve recently discovered. Gabby posts so many delicious healthy vegan recipes that I literally want to try them all. 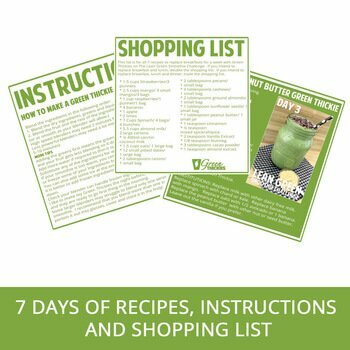 If you are looking for some great plant based food recipes, this is a very good place to start. The original recipe was made thicker because it was served in a bowl which is a great idea if you want to swap a green thickie for your normal bowl of cereal. I am going to do this at some point but at the moment it’s still much more convenient for me to drink them as I can get on with other things. If you like Cookie Dough, you’ll love this recipe. 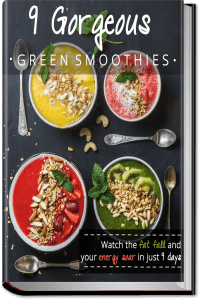 It’s definitely a dessert thickie as well as a green smoothie of the week (bonus 2 recipes in one), so it will be really filling, fulfill your dessert cravings and still be extremely healthy as it contains greens. I made a dessert thickie with no greens for my husband and added greens for me and my baby which is why one of the smoothies is cookie coloured and the other is green. 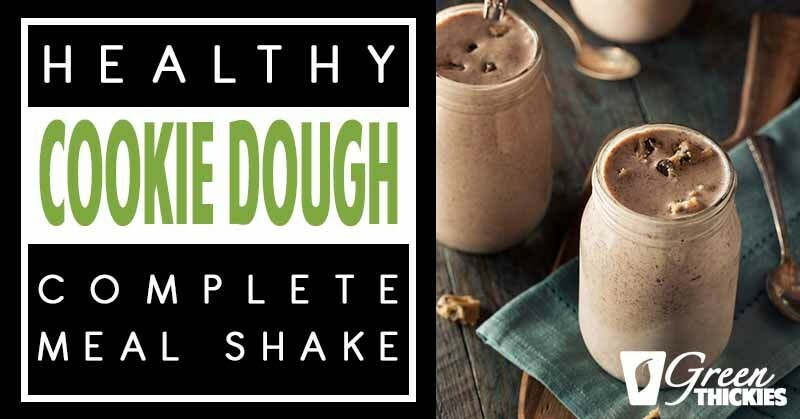 This homemade cookie dough green smoothie recipe is so filling, will fulfil your dessert cravings and is still extremely healthy as it contains greens. 2 Cup Kale, tightly packed or 2 cups loosely packed. (Or Spinach or any other mild greens) OR if you run out of fresh greens, add 2 scoops of Amazing Green Powder for an extra healthy green boost. If your blender has made the smoothie too warm, you can either cool it down in the fridge or freezer, or add some ice cubes or frozen fruit to it (This might water the flavour down). 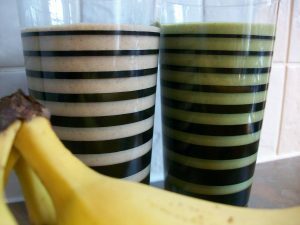 If you want to check if you can drink green thickies on your special diet, please read this first. Comments are extremely welcomed. Many thanks and blessings to you. Yum! Your version looks awesome :) Thanks for the mention, you’re a doll! I will get back to your email soon I promise! I myself have been having some busy times but I will reply in the next couple of days! Thank you, your blog is amazing and recipes so delicious so hopefully others will enjoy your recipes as much as I have. Don’t worry there’s no rush – I know the feeling! Hi Katherine! Thanks so much for linking up this smoothie recipe at last week’s Allergy-Free Wednesdays! I’d love to showcase it as one of my features for this week, but I need you to link back. All features have to be linked back in order to spread word throughout the food allergy community. You can link back to any of the hosts, but here is a link to my blog hop post from last week. Thanks! I’ll check back in later today to see if you’ve linked back. Thanks so much for your lovely comment, and that you’d love to showcase it as a feature for this week. Thanks for letting me know about linking back. I’ve now added a link to this post. I recommend Allergy Free Wednesdays as a great place to find recipes for special diets. Thank you for setting it up. Wow! You’re lightning fast at getting that link back in. Thanks! I hope you’ll check out tomorrow’s blog hop and link up again. Your feature will also be showcased on my facebook page and pinterest. Yay! I can’t wait to try it out. Thanks Michelle, that’s very kind of you to showcase it. It is a gorgeous recipe, thank you for all your work on Allergy Free Wednesdays. It’s a great resource.